Presenteesim, stress at work, mental health and wellbeing and long term sickness help in Truro, Falmouth, St. Austell, Exeter and across Cornwall and Devon. Do you have staff who are struggling at work with stress, or problems with long term sickness? Are you struggling to get an individual back to work after many months? Is your business going through lots of change and need the staff to move with you? If you answered yes to any of these, then The Thrive Programme can help you. How does stress in the workplace affect productivity? In this chart it shows that stress relate absence has either increased or stayed the same for 70% of the companies surveyed in the 2018 CIPD Health and Wellbeing at work report. So current interventions and practices, such as stress management training, are not helping or resolving the issue. Leavism is on the up i.e. people taking leave when they are actually ill. It can be difficult to determine the costs of presenteesim. However, New research from Nottingham Business School 2017 claims the average UK employee spends almost two weeks a year at work while ill, costing firms more than £4,000 per person. In line with the research above, a survey of 300 employees working for a large UK utilities company, reported staff working for an average of 13.09 days while feeling unwell in 2016 – far higher than the reported average annual sickness absence rate of 6.63 days per employee. Further reports state that the average employee reported functioning at a capacity of 84 per cent on the days they worked while ill, leading to an annual lost productivity cost of £4,058 per person. The table here shows that mental ill health is the top cause of long term absence in all sectors of business. The numbers to the left show where each category ranked for short term absence. The inference could be that minor illnesses are an indicator of the first signs of stress - in the long term it can lead to mental health issues. If you then have to replace the member of staff, further costs are incurred. Some studies, such as the Society for Human Resource Management (SHRM), predict that every time a business replaces a salaried employee, it costs 6 to 9 months’ salary on average. For high-turnover, low paying jobs (earining under £30,000 a year) the cost estimate is 16% of annual salary. For example, the cost to replace a £10/hour retail employee would be £3,328. Should make a persuasive business case for investing in a healthy culture. There are lots of very interesting articles covering mental health in the workplace on the BBC website. For example, for a company with 500 employees, where all employees undergo intervention, it is estimated that an initial investment of £40,000 will result in a net return of £347,722 in savings. This is mainly due to reduced presenteeism (reduced productivity, due to an employee working while ill) and absenteeism (missing work due to ill health)5. In addition, findings suggest that those businesses who invest in their employees’ health and wellbeing are reaping the rewards. Of those that offer health and wellbeing benefits, more than three in four (77%) believe this has had a positive impact on the workforce. Employers also report increased happiness levels (41%) among employees with improved morale (32%) and productivity (30%) as a result of having initiatives in place to keep employees healthy6. This short, simple and evidence based training programme teaches staff to understand every aspect of their thinking. This means that they will have clarity on how they create stress and anxiety. Furthermore, the programme gives individuals the tools to improve all their key psychological foundation stones so that they have high self-esteem, social confidence and a strong sense of power and control. The programme is normally delivered to groups over 2-3 workshops, with additonal one to ones with staff members. The approach is flexible depending upon the needs of your business. Each participant will have their own workbook to use whilst learning to thrive and a journal so they can continue to focus on thriving objectives beyond the training. Please contact Ali to find out more and discuss the options and pricing. When you have happy, confidence staff who can cope with challenging situations, projects or people your business will be thriving. In addition, you are much less likely to loose disgruntled or stressed out staff. 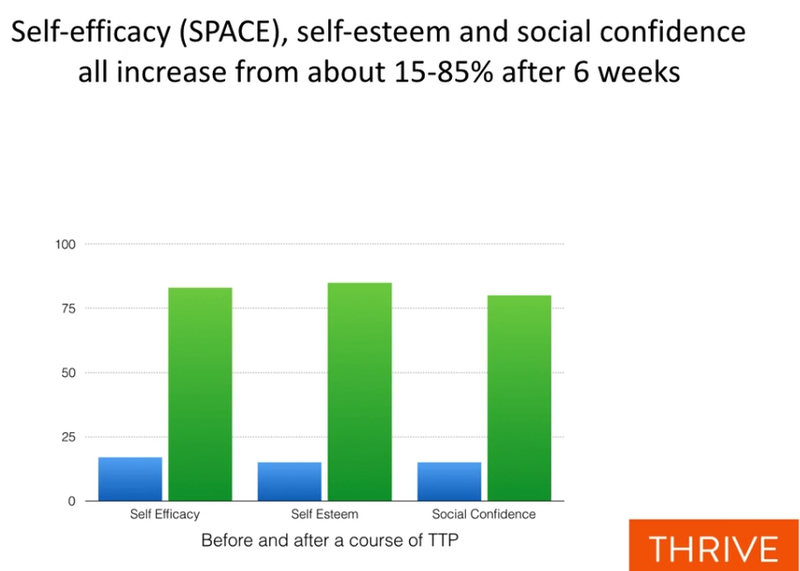 The graph to the right here demonstrates the huge effect that completing The Thrive Programme can have on self esteem, SPACE and social confidence. All of which rise from around 15% to 85% in this sample. Sixty percent of employees have experienced mental health issues in the past year because of work. Almost a third of the workforce have been formally diagnosed with a mental health issue. The most common diagnosis was depression or general anxiety3. More than two in five admit they often feel stressed or anxious at work4. Furthermore, companies may have staff welfare at heart but in fact staff may not feel comfortable talking about mental health. In a BBC article in December 2017, a poll of 2,025 UK workers found that only 16% said they would raise the matter with a line manager. Shekelle et al., 1981, Psychological depression and 17-year risk of death from cancer. National Employee Mental Wellbeing survey in partnership with YouGov 2017. The Aviva Working Lives report 2017. Mental Health Foundation report 2016. If you would like to find out more about how we can help your business, or you would just like to discuss your business challenge to get some advise, please get in touch. I offer a free, no obligation, confidential initial consultation. Thrive with Ali helps businesses in Falmouth, Truro, St. Austell, Newquay, Helston, Penzance, St. Agnes, Camborne, Redruth, Penryn, Portleven, St. Mawes, The Roseland, Perranporth, St. Ives, Hayle, Portreath, Bodmin, Launceston, Plymouth and Exeter.